Once again, a hurricane dominates the happening in Louisiana. 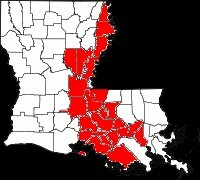 Seven years after Hurricane Katrina, Hurricane Isaac causes prison inmate evacuations in Orleans, Terrebonne and St. Bernard parishes. Crowded correctional facilities as the Louisiana State Penitentiary get even more crowded. Pardon hearings and weekend visitations are cancelled. See the news from the Louisiana Department of Corrections.